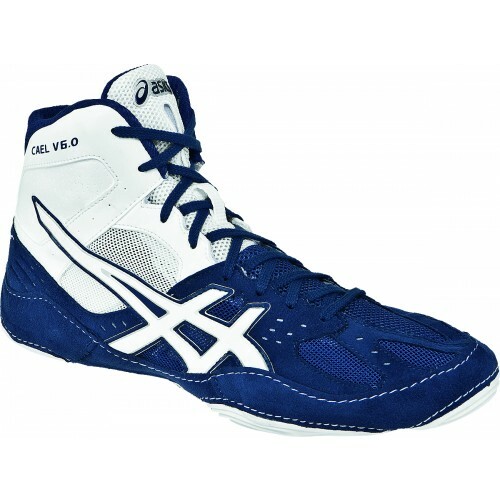 The ideal all around wrestling shoe at a great price. The flexible sole design features rearfoot and forefoot “serradial” traction pods for enhanced grip on the mat. The signature shoe of undefeated four-time NCAA National Champion and current Penn State Wrestling coach Cael Sanderson. The Cael V6.0 has a ComforDry sockliner with an ecsaine and open mesh upper. This shoe also comes with a NC rubber outsole and lace garage. Lighter than the previous model, the new Cael® V6.0 offers a new upper that has a more anatomical contour, for a more personalized fit. An air mesh quarter panel provides breathability which is sure to keep you cool during your most competitive and intense matches. The tongue features a less bulky version of our Integrated Lace Garage which meets regulation for tournament competition.